In 1965, renowned photojournalist James "Spider" Martin was the youngest freelance photographer at the Birmingham News, where he covered everything from Alabama football to country club social events. Witnessing the violent treatment of peaceful protestors had a profound effect on Martin's career. His images of Bloody Sunday, March 7, 1965, in Selma, Alabama, galvanized public opinion in support of the protesters. Martin joined the historic march from Selma to Montgomery later that month in two capacities: as a member of the media and as a participant in the struggle for racial equality. Through Martin's camera and the words of Congressman John Lewis, former head of the Student Nonviolent Coordinating Committee (SNCC), March to Freedom follows a determined group of marchers, both black and white, as they tried on three different occasions to take their cause to the steps of the Alabama Statehouse in Montgomery. Admission is free. Individuals are welcome to attend during college open hours. Groups are invited to reserve a time by calling the box office at 908-725-3420 (weekdays, 11-4) or emailing http://theatre@rvccArts.org. 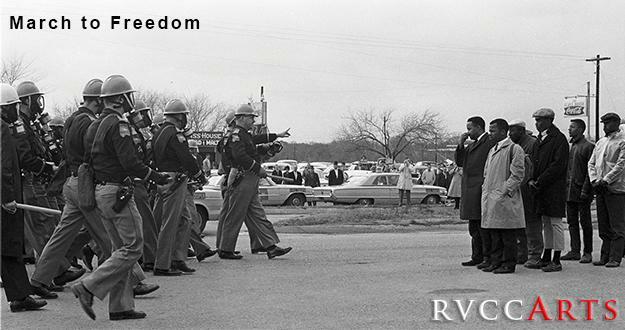 March to Freedom is an exhibition by the Dolph Briscoe Center for American History at The University of Texas at Austin and the LBJ Presidential Library, presented in partnership with Humanities Texas, the state affiliate of the National Endowment for the Humanities. Martin's photographs from March 1965 are part of the Briscoe Center's extensive photojournalism holdings.